Caltrain's revised DEIR for the electrification project is about to be released for public comment. Meanwhile, California's high-speed rail project has suffered legal setbacks that may end up threatening a $600 million contribution of Proposition 1A HSR funds promised for Caltrain electrification (the so-called "book-end" funding). These events have awakened a small but vocal and persistent minority of peninsula residents who believe Caltrain should not electrify, and should seek alternate short-term solutions. We've seen this pattern before: there was a lot of misinformation circulating about hybrid DMU trains, which were seen as an alternative to electrification when in fact they do not exist and are not capable of meeting Caltrain's requirement for high-capacity, high-acceleration rolling stock. The new idea now going around at least has the merit of being demonstrated in the real world. The idea is to replace Caltrain's locomotive fleet with a new type of locomotive known as a dual-mode locomotive. You can think of it as two locomotives in one, combining a conventional diesel power train with the ability to operate on electricity where 25 kV overhead electrification is available. To pull off this feat, the locomotive needs to carry not only a diesel power plant and an electric generator, but also a big transformer to bring the 25,000 volt electric supply down to usable voltages. There is an off-the-shelf example: Bombardier's ALP-45DP, shown in the photo at right. A small fleet of these beasts operates for commuter agencies in New Jersey and Montréal, Canada, where certain lines are only partially electrified. Rather than inconveniencing passengers with a change of trains where the wire ends, these locomotives fire up a pair of 2,000 horsepower V-12 engines and continue their trip beyond electrified territory. These make absolutely no sense for Caltrain. They are expensive. Two locomotives in one cost almost as much as two locomotives. New Jersey Transit paid $8 million for each one in 2010. Caltrain would require a fleet of about 25. There goes $200 million, nearly half the amount allocated to the new fleet purchase under the electrification project, and none of Caltrain's aging passenger coaches would be replaced. They are heavy. These locomotives have the heaviest axle load of any passenger locomotive in the world, at nearly 33 metric tons. Heavy beats up the track and increases maintenance costs. They are slow in diesel mode. Even with two 2,000 hp V-12 engines pulling as hard as they can, the million-pound weight of a Caltrain commuter train will hold the train back and limit the trip-time savings of an all-stops peninsula local to just one minute, all else being equal. They are slow in electric mode. Imagine that some day the funding finally comes together to string up electric wire along the entire length of the peninsula. The laws of physics being what they are, the power-to-weight ratio and the weight on drivers of a train powered by a dual-mode locomotive does not allow it to accelerate quickly, even if its rated top speed is 100 mph. 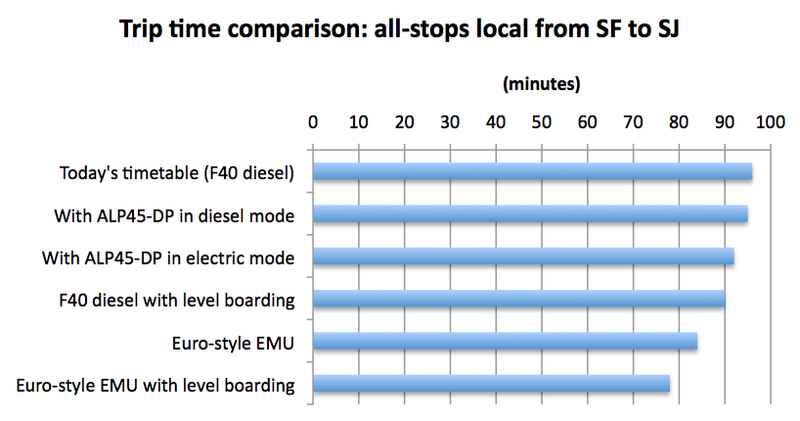 In stop-and-go service on a local train, an ALP-45DP running in 100% electric mode would only save four minutes on its entire run between San Francisco and San Jose, compared to today's timetable. The trip time savings simply aren't worth the high cost of dual-mode locomotives. 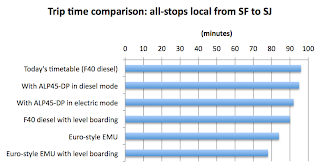 Level boarding by itself (even with diesel locomotives) would save more time. The lightweight and powerful EMU trains that Caltrain plans to purchase would save far more time, and are unbeatable when combined with level boarding. See chart at left. The only remote opportunity that dual-mode locomotives might present is the ability to serve the Transbay Transit Center, which is not designed for diesel trains, prior to the full electrification of the peninsula corridor. The San Francisco downtown extension tunnel, however, won't be completed for at least another decade and will cost two to three times more than Caltrain electrification. That's an awfully long time to realize the meager benefits of dual-mode locomotives, on a shaky premise that funding won't be available for Caltrain electrification even after the DTX is paid for in full. For the peninsula rail corridor, dual-mode locomotives are clearly a proven solution looking for a problem. The better problem to solve is how to fund the electrification project even if the high-speed rail funding is denied. The San Bruno grade separation, a $155 million project that does nothing for the average Caltrain rider, is nearing completion. If you wondered where some of that money went, here you go. The Canyonero of signals is surely this brawny Made in U.S.A. signal gantry mounted on top of the San Bruno grade separation. The gantry (probably a standard two-track gantry, to save money!) was too wide to be mounted in this location, so two cantilevered concrete platforms, seismically worthy, were built on each side to support the gantry and keep out any terrorists. [UPDATE: check out the engineering drawing!] 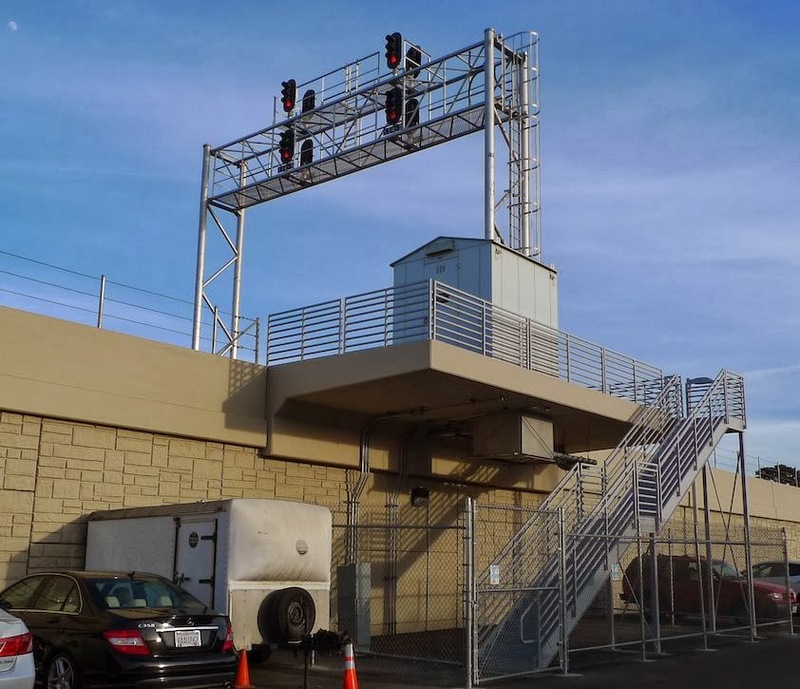 If that wasn't enough, this signal gantry needed its signal house (probably a standard 8'x8' signal house, to save money!) 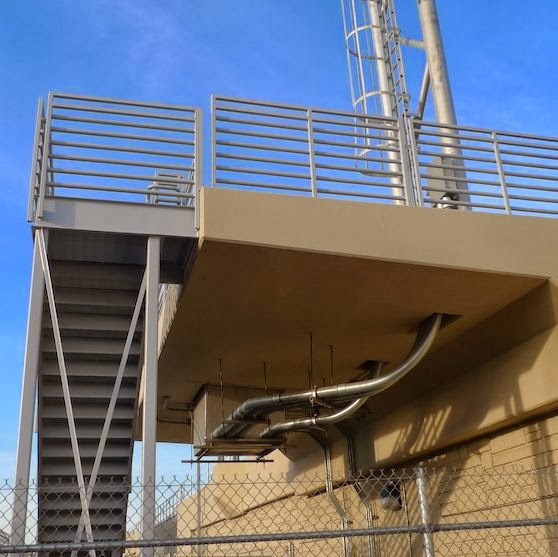 perched on top of the opulent platform as well, with classy electrical conduits slung underneath and a dedicated ADA-compliant staircase allowing maintenance personnel ready access. Maybe they were trying to save some parking spaces by suspending everything, but the entire area had to be fenced in for security. If you asked the engineers who designed this, they could no doubt bend your ear about why it ended up this way and how numerous standards and requirements conspired to force exactly this solution. That doesn't remove the simple fact that it's wrong. It isn't simple, elegant, efficient, or thrifty; it fails to satisfy basic ideals that all engineering has aspired to since time immemorial. The ridiculous, over-wrought outcome of rigid paint-by-numbers adherence to prescriptive requirements and standards would be comical if it weren't such a waste of the scarce taxpayer dollars available for rail projects. (Or even that sub-category of rail projects solely benefiting automobile traffic flow.) It's a basic signal gantry, for crying out loud. Oh, and the new speed limit at the San Bruno curve, the #1 worst curve on the entire peninsula? 65 mph, up from 60 mph before. It could have been 100 mph if this project had been conceived intelligently. The concrete has been poured, and this installation shall now and forever stand as a monument to our Transit Industrial Complex, as it embarks on far more challenging endeavors such as electrification, level boarding, the downtown extension, and maybe some day high-speed rail. The symbolism is hard to avoid. The San Francisco downtown extension, as environmentally cleared and approved, ends at the existing grade crossing at 7th and Mission Bay Drive (formerly Common Street). Somebody apparently forgot that this will leave grade crossings at Mission Bay Drive and busy 16th Street, where it still isn't exactly clear how to cross a trolley bus line with a 25 kV electric railroad at grade. With train traffic expected to double in the next 15 years, conditions at those intersections are expected to become unacceptable, a problem which is now being considered along with redevelopment ideas for the Mission Bay neighborhood. A number of radical solutions were proposed by outside groups (including the city!) coloring outside the lines of the environmentally cleared and approved DTX project, thus causing significant unease at TJPA headquarters. 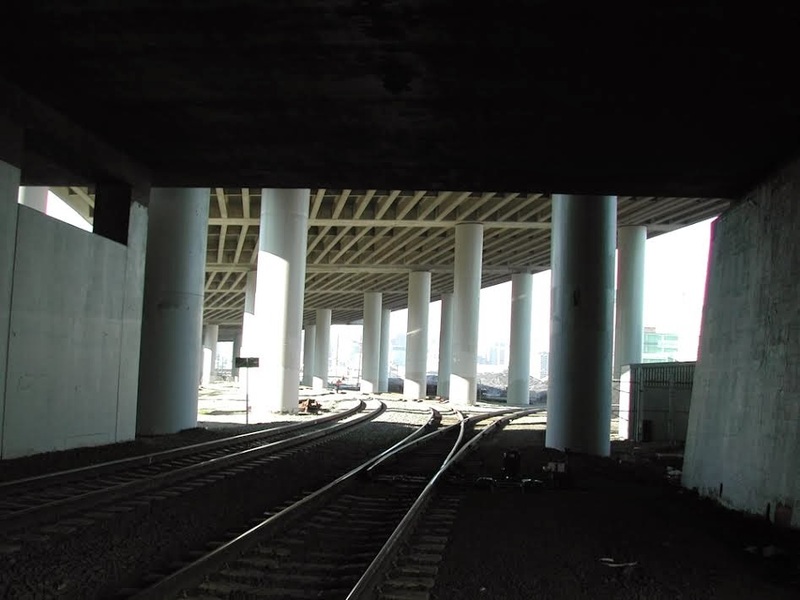 To regain control of this issue, the TJPA commissioned a white paper study by engineering consultants Parsons Transportation Group and Jacobs Associates (organizations with considerable tunneling expertise), entitled Proposed Alternative Tunnel Connections to the San Francisco Downtown Rail Extension. City SPUR Presentation Option 1 – This option consists of a trench trackway in between the I-280 freeway pilings. The presentation noted that this option may not be feasible, and therefore it is not discussed further in this white paper. This seems like a rather weak rationale for not further discussing or studying a particular option: somebody else, presumably far less-qualified than the Parsons / Jacobs engineering team, happened to cast doubt on it. One could cast a similarly dismissive eye on the entire study. 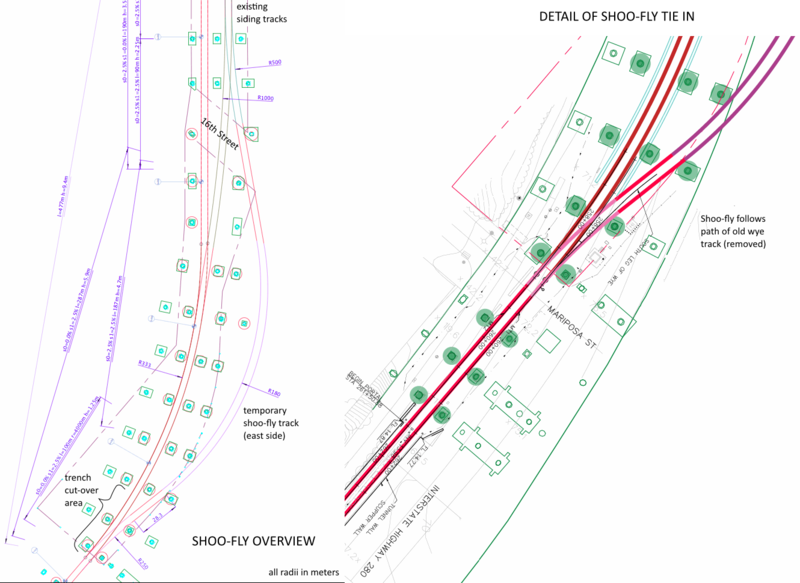 It boils down to considering various complex and over-wrought tunneling options (considering arcane subjects such as boring machine types, ventilation zones, and even tsunami run-up) in order to grade-separate these two streets for an estimated cost of well over a billion extra, compared to the current DTX plans. That's right, BILLION. Two grade crossings. If you do the math, at least $500 million a pop works out to about ten times what a typical grade separation should cost. The study's conclusion, not surprisingly, is to proceed with the TJPA's environmentally cleared and approved DTX plan so as not to upset or delay anything, with the understanding that nothing in the current plan precludes grade-separating in the future, if someone finds more than a billion under a rock. Grade-separating a couple of streets doesn't need to be so ridiculously expensive or complicated, of course. 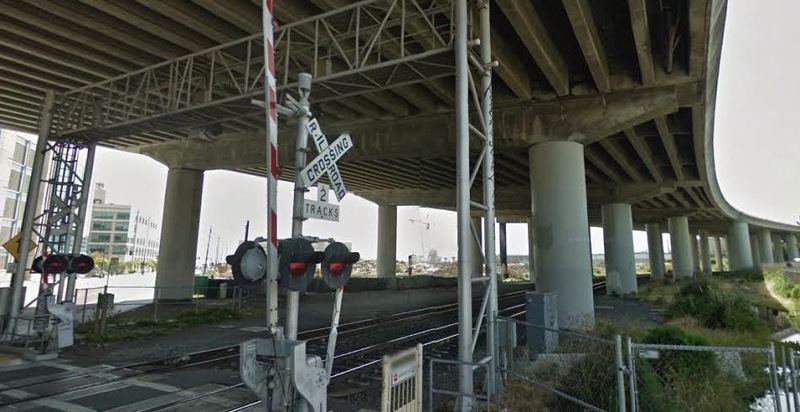 It requires an open trench built under the I-280 freeway, along the current alignment of the tracks and between the large pilings that support the freeway. 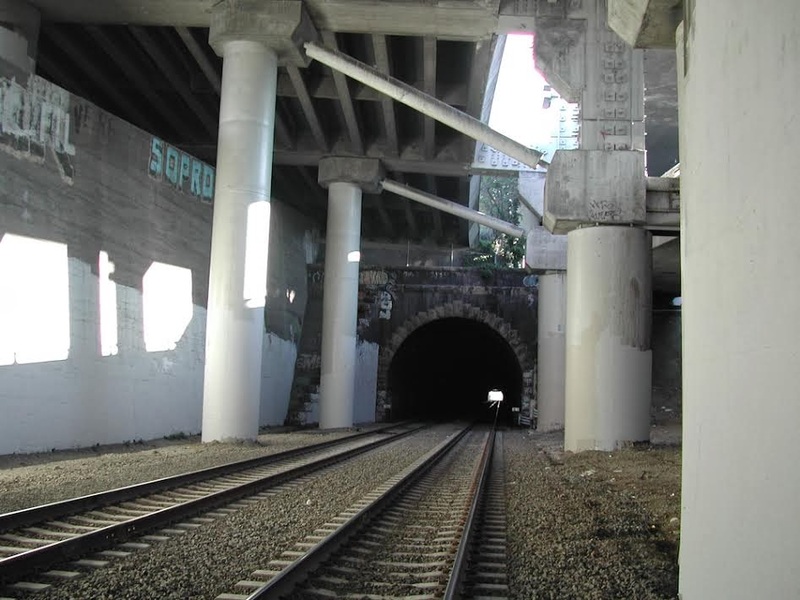 This trench would pass under Mission Bay Drive and 16th St, then climbing steeply (2.5% grade) to meet the existing portal of Caltrain Tunnel One. No new tunnels would be built, and the freeway could later be torn down if the city so desires. There are a number of arguments raised against a trench at this location. 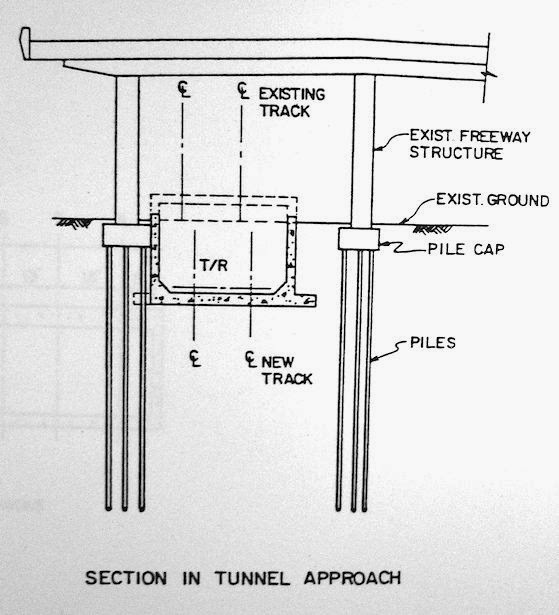 To see what a trench built between the I-280 freeway pilings might look like, we can set our way-back machine to the year 1987 -- more than a quarter century ago -- when Morrison-Knudsen Engineers performed a study entitled Peninsula Commute Service Interim Upgrade Study that included the I-280 diagram at right. In 1987, the idea of building a rail trench under an elevated freeway wasn't simply dismissed without further consideration. And suppose the trench did come too close to some I-280 piles? The 1989 Loma Prieta earthquake triggered a massive seismic retrofit of the I-280 freeway, during which Caltrans demonstrated a surprising ability to add or move bents under an active freeway. Even temporary solutions would be acceptable, since the city plans to tear down this section of I-280 in the short to medium term. The biggest shame would be to spend a billion-plus dollars to avoid freeway pilings that are about to be dismantled. There is already a large sewer passing under the tracks at Division Street (see profile diagram above). 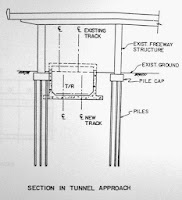 Furthermore, the San Francisco Public Utilities Commission is in the planning stages of a $1 billion sewer project known as the Central Bayside System Improvements, which will involve tunneling a new 27-foot "Channel Tunnel Connection" underneath the tracks (see profile diagram). The approved DTX project artfully avoids the sewers by surfacing before the sewer crossings, but a trench or tunnel would inevitably conflict with them. 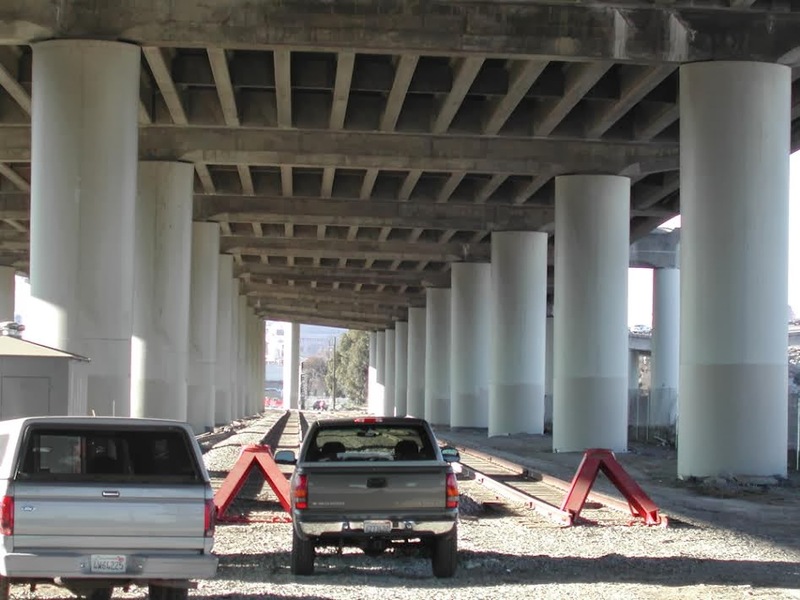 The TJPA study assumes the new sewer tunnel forms the controlling constraint on the vertical alignment of a grade separation rail tunnel, which sends the rail tunnel so deep underground that it can no longer connect to the existing Caltrain Tunnel One. That's what makes the proposed rail tunnels so long (all the way to Cesar Chavez!) and so expensive. This raises an interesting question of underground right-of-way: should the rail tunnel yield to the sewer tunnel, or the other way around? Without very much expertise in the art of pumping enormous flows of sewage, one might guess that sewage is more flexible than trains when it comes to changes in vertical profile. The SFPUC and TJPA need to be prodded to come to a more realistic agreement on this issue, rather than flushing well over a billion of scarce rail dollars down that new sewer. 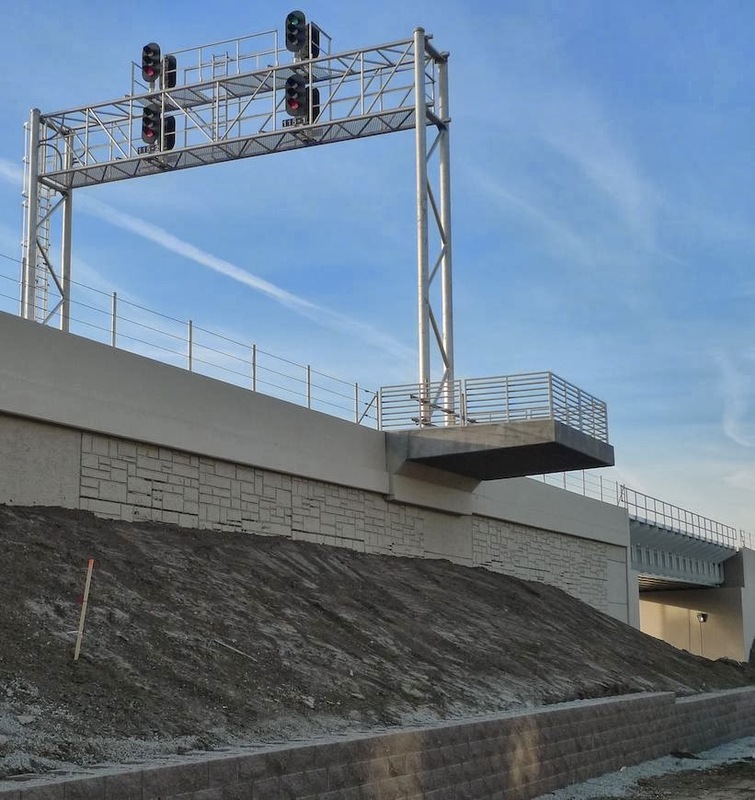 insufficient length is available to transition from the tunnel below 16th Street to at-grade at Tunnel One while complying with vertical grade and curve requirements of DTX, Caltrain design criteria, or accepted railroad engineering practice. 2.5% is not an impossibly steep grade for EMU electric rolling stock of the sort contemplated by Caltrain and the high-speed rail authority; portions of the high-speed rail system are being engineered with grades approaching 3.5%. If there is a problem here, it is clearly with overly conservative DTX vertical grade requirements and Caltrain design criteria. American "accepted railroad engineering practice" is totally irrelevant here, being firmly rooted in freight train operations. If anybody tells you a 2.5% grade is impossible, ask for a second opinion, preferably from a European engineering consultant. And there are ways to reduce the required dive: 25 kV overhead electrification clearances could be reduced by several feet by using rigid overhead conductor rails (instead of wires), or 16th Street could be raised by a few feet. It sure is tight, but it most definitely can be done. Keeping Caltrain operating during construction of the DTX connection is obviously a major concern. It would be necessary to construct a temporary shoo-fly track on the east side of the existing tracks, to enable the trench to be constructed where the current tracks exist. There are already some siding tracks to the east under I-280, but the challenge is to dodge out of the forest of freeway bents at Mariposa Street without violating side clearances between trains and concrete, along the path of an old wye track that was recently removed. This can most likely be done as shown in the diagram at right; it is a puzzle that requires all the ingenuity our transportation industrial complex can muster. If bents must be moved, then move them. If clearances are truly insufficient, CBOSS can be used to enforce single-occupancy of the narrow section. The TJPA study describes how the DTX project would be staged to allow tying in to a future grade separation tunnel. The staging concept described would require disconnecting the Transbay Transit Center for several weeks or months while the new connection is made, with the 4th and King terminal used on an interim basis. This staging concept is surely more time-consuming and disruptive than the trench tie-in work implied in the shoo-fly diagram above, which could probably be pulled off over a three-day holiday weekend. Far more complex operations were pulled off on that time scale at the Bay Bridge. Dismissing the trench grade separation alternative is premature and poorly justified. Boundaries should be pushed and "requirements" should be questioned. Coordination between the city, the TJPA, Caltrans and the SFPUC should be improved with the help of the Mayor's Office, and if necessary the Governor. Most importantly, the small sliver of land between Mariposa and Sixteenth should be temporarily preserved from development until the DTX is completed, so that a shoo-fly can be built there. Without a doubt, this trench would be a tough grade separation to engineer and construct, but when the only alternative is a billion-plus bored tunnel, there are suddenly a billion-plus reasons to take another look to make it work. 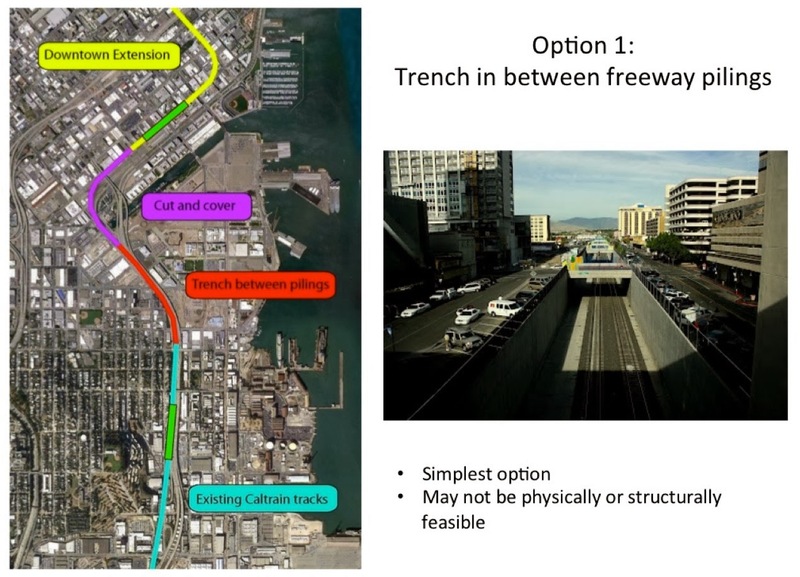 With the extensive means of excavation to be mobilized for the DTX project, the incremental cost may be small enough that Mission Bay and Sixteenth can be grade-separated concurrently with the DTX, without delaying the project. The TJPA and its consultants should be sent back to the drawing board to study the feasibility and cost of the trench option in much greater detail.